The main business centres are Moscow, St Petersburg, Nizhny Novgorod, Novosibirsk and Vladivostok. Formal business etiquette is very important and both men and women should wear smart, restrained business suits. Appearance is very important, especially in Moscow, where dark suits and polished shoes are essential. Business visitors should start each meeting with a handshake and exchange business cards, printed in both English and Russian. Visitors should always wait for the senior Russian present to start the meeting and participate only when invited to. Referring to colleagues by their first name and patronymic is a good way to show knowledge of Russian culture. Business is still largely a male pursuit in Russia, though Western businesswomen will be treated in the same way as male colleagues. If you have a meeting with a Russian woman, only reach out to shake hands if she offers her hand first, as unsolicited physical contact is considered rude. If you are invited to a Russian home, bring an odd number of flowers (even numbers are reserved for funerals) and wine, champagne, or chocolates as a gift. Always remove your shoes at the front door (generally the host will offer house slippers to wear inside), and try not to discuss business unless the host initiates it. One should never refuse to drink a toast but beware of the effects of Russian vodka and learn when it is allowed to say no. Directness that can verge on rudeness, and evasiveness that parades as politeness are part of the Russian style of negotiation, so be persistent if you need specific answers to your questions. Be sure to get firm and positive answers - preferably in writing. Russia is still an extremely bureaucratic country, so always be aware of the official regulations. Ignorance will not be accepted as an excuse if you break the rules, and the penalties can be severe. It is bad form for visitors to criticise the host nation; concentrate instead on the positive aspects of your trip. Be aware that the Russian media is state-controlled so locals may have a different take on international affairs to the accepted view in other countries. Mon-Fri 1000-1800, with a lengthy lunch break, usually from 1200-1400, during which no work is done - even telephones are left unanswered. The main bulk of Russia’s economy rides on its huge wealth of energy resources - it has huge deposits of oil and gas (in 2011 it became the world’s leading oil producer) as well as coal and minerals including gold, diamonds, nickel, manganese, copper, iron ore and phosphates. Energy products and heavy industry (production of vehicles, metal goods, construction materials and machinery) are the kernel of Russia's industrial sector. Textiles and chemicals are other important industries. Overall the economic system remains weak and infrastructure and transparency poor. Only Russia's vast energy wealth has managed to override this problem, though the world financial crisis has re-exposed the fundamental weakness of the Russian economic system. 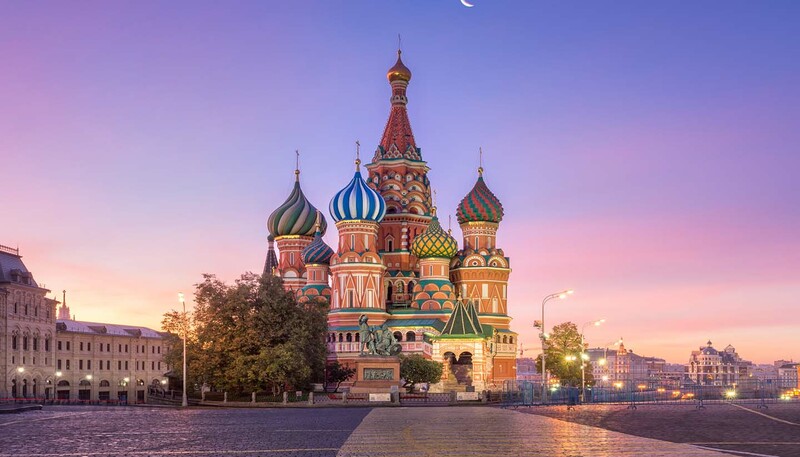 Since the devaluation of the rouble and Russia's calamitous default on its international debts in 1998, the economy has undergone a significant recovery, although the financial crisis of 2008 stalled this recovery due to the drop in oil prices. The government has got on top of the hyper-inflation that caused so much damage in the initial stages of the reform process, but the boom-and-bust cycles which go along with having such a resource-dependent economy still continue, and subsequent efforts to develop the technological sector and reduce dependency on oil and gas, have not been as successful as initially hoped. Petroleum and petroleum products, natural gas, wood and wood products, chemicals and manufactured goods and military hardware. Machinery and equipment, vehicles, pharmaceuticals, plastic, meat and sugar. Most Moscow hotels have telephone booths with IDD. For long-distance calls within the CIS (Commonwealth of Independent States), dial 8 then wait for the dial tone before proceeding with the call. Collect calls, calls placed using credit cards and calls from direct dial telephones in hotels can be extremely expensive. International calls can be made from phones in the street and phonecards are available from many shops and kiosks in the street. Wi-Fi is available within most establishments in larger cities (although they may charge) and at internet cafes. Although Russia does not ostensibly censor the internet, there is an internet blacklist of sites which you will not be able to visit from inside Russia, which includes some independent news sites. The arrival of Putin in 2000 saw a new era of unofficial government press control for Russia, which appears to be continuing under President Medvedev. Most of the mainstream press is uncritical of the Kremlin. The main quality dailies in Russia are Izvestiya and the business-oriented Kommersantand Vedomosti, all published in Moscow. Big circulation tabloids include Argumenty I Fakti (now owned by the Moscow government) and Komsomolskaya Pravda. The daily Moscow Times and twice-weekly St Petersburg Times are published in English. In terms of television, there is currently no independently owned national TV network. VGTRK is a state-owned national TV network. NTV is a national network owned by the gas company, Gazprom. Russia Today is an international English news channel run by a state-owned agency. Other networks include STS, TNT, MTV Russia and REN TV. When it comes to radio, Russkoye Radio and Eko Moskvy are privately run, whilst Radio Russia and Radio Mayak are state-run networks. Voice of Russia operates programmes in English and other languages. There is an extensive postal network throughout Russia. Airmail to Western Europe takes over 10 days and has a reputation for being unreliable when it comes to international mail. There are postboxes and post offices in every hotel. Inland surface mail is often slow.